I love beetroots, especially roasted or in soup. 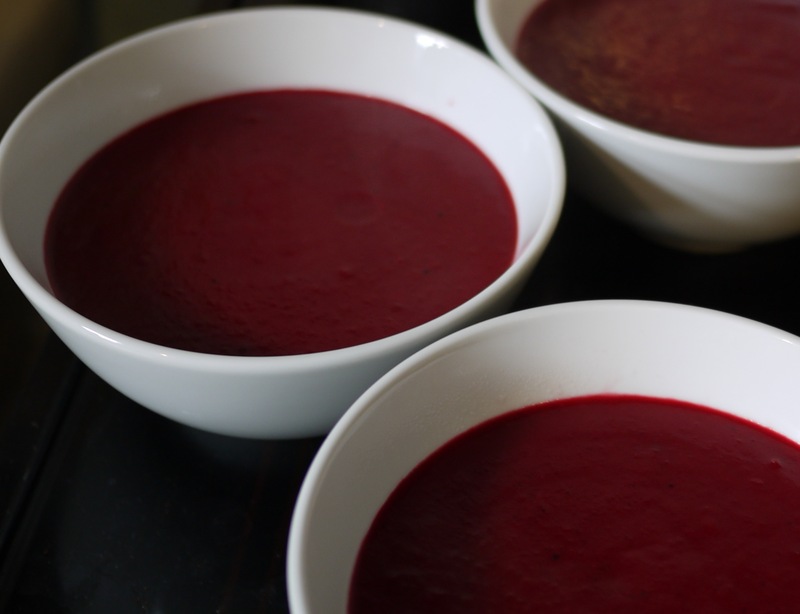 In fact roast beetroot soup is just brilliant, super tasty and very easy to make. I just had some for lunch so I thought I’d share my recipe. 1. Wear rubber gloves or you’ll end up with beetroot stained hands! 2. Top, tail and peel the beetroots and cut into quarters (make sure they are roughly even sized so cut larger beets into eighths). 3. Put beetroot pieces in a bowl, pour over about two tablespoons of oil and toss the beets to get them evenly coated. 4. Roast the beets for about an hour in the oven at R6/200C, turning once or twice. Its nice id the corners catch a bit but not too much. They are ready when you can slide a knife in easily. 5. Gently cooked the onions in a tablespoon of oil for about 10 minutes so they are golden and soft. 6. Meanwhile boil the peeled potatoes until soft but not falling apart. 7. Add the cooked beets and potatoes to the onions, pour on the stock. Taste for seasoning. My stock was well seasoned so it didn’t need any more at this stage. 8. Bring to the boil and simmer gently for about 10 minutes. Leave to cool slightly. 9. Blend to a relatively smooth soup using your preferred method/gadget. Pour back in the pan and warm through. 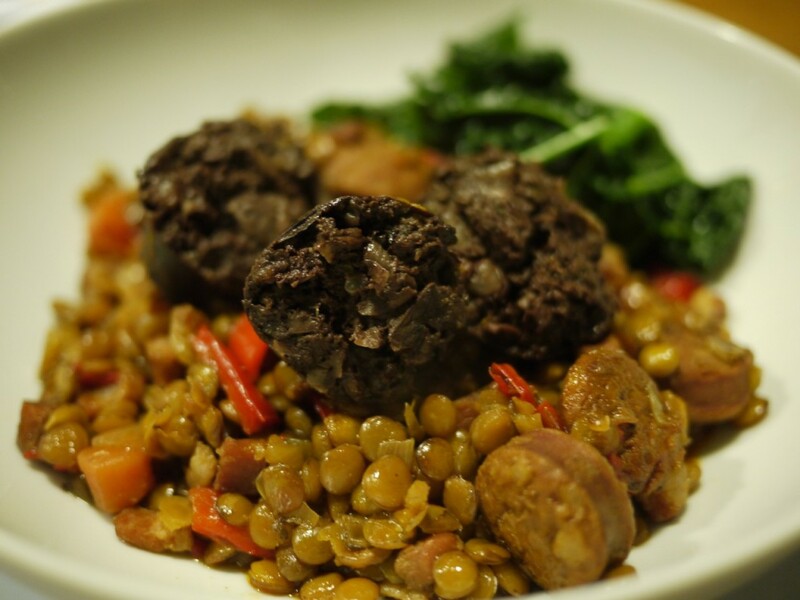 Its pouring with rain today in London making the autumn evening dark even sooner…whats needed is a warming stew. I’ve made this one a few times but the first time I did was back in early 2010 when the lovely people at Orce Serrano Hams sent me some of their chorizo and morcilla to try. 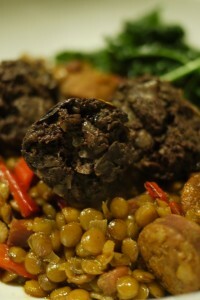 This dish adapted from the Moro cookbook seemed the perfect way to try them out. It’s pretty easy and quite and of course you can use chorizo and black pudding sourced in the UK but the Orce morcilla was something truly special, well worth treating yourself or friend to. Heat the oil and then add the sliced chorizo and fry over a medium heat to cook and low the spicy juices to flavour the oil. Push the chorizo to one side and add the onion and peppers if using, cook for 5-10 minutes over a low heat to soften. Add the lentils and then the spices. Pour over the stock and bring to the boil. Drop in the sliced morcilla and top up the liquid so everything is just covered. Simmer until the lentils are cooked and the liquid absorbed (20-30 minutes). Serve with steamed greens or cabbage and mash or sourdough bread. After a few days of Indian summer the weather has gone rather cool and chilly. So I’ve been thinking about toasted tea cakes, warm Ribena and snuggly woolly jumpers. A tip off from @SaltYardBooks about this natural undyed collection of British wool made me head to the Rowan site. I really quite want this cardigan in their Steel Grey Suffolk wool. Except I am the worlds slowest knitter. So I might just have to dream. I’ve been reading quite a few cookbooks recently that have a seasonal theme to get some new ideas for different winter dishes. 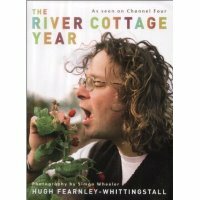 I’ve been particularly enjoying Hugh Fearnley-Whittingstall’s (HFW) ‘The River Cottage Year‘ (this link is to Amazon.co.uk). I’d already tried a couple of the soup recipes and then I spotted the recipe for ‘Smoky cheaty brandade’ (page 49) and I just happened to have some smoked haddock that I’d been planning to use for kedgeree but thought I’d try the brandade instead. It was fairly simple to make (about 1 hour total from start to sitting down to eat – and of that time about 20 mins was prep the rest was the dish cooking). I made half the quantity in Hugh’s recipe and 2 of us ate half of it so I now have plenty left which I’m planning to fry up as fish cakes later the week. I guess if you had a really big appetite it wouldn’t go this far but with some braised courgette and greens it made a good size main course which we followed with some cheese. Poach the fish in the milk for about 5 minutes (the milk should just cover the fish and if the fillet is particularly thick it may take a few minutes extra – its ready when the flakes will separate easily – use a sharp knife to test it). Leave the fish in the milk to cool. Boil the potatoes in lightly salted water until tender, drain then mash with a generous knob of butter and some of the poaching milk to get a soft but not sloppy mash. Remove the fish from the milk and flake it off the skin and make sure you pick out any stray bones, discard the skin and bones. Pour the olive oil into a small pan and add the finely chopped garlic, sweat on a very low heat for 2-3 minutes and don’t let the garlic colour. (I used the full 4 tbsps of olive oil even though I used only half the quantity of fish and potato). Put the fish into a food processor and pulse to a paste whist adding the olive oil/garlic until the fish is the consistency of mash potato – add more oil or the cream or some of the poaching milk to achieve this. Mix the fish and mashed potato together – BUT NOT in the food processor or it will go all gluey – and season with black pepper. Spread in an oven proof dish and bake at gas 5 (190C) for 15-20 mins. (It didn’t go very brown on the top so you might want to crank the oven up for the last few mins or pop it under the grill if this is the effect you are looking for. I imagine it would be pretty tasty with some grated cheese on top). Serve with toast and/or greens, leek, chicory or other green veg. (We had greens and courgette – tho I admit the latter is not very seasonal).